First on this tape, Star Trek Voyager and an episode called Non Sequitur. 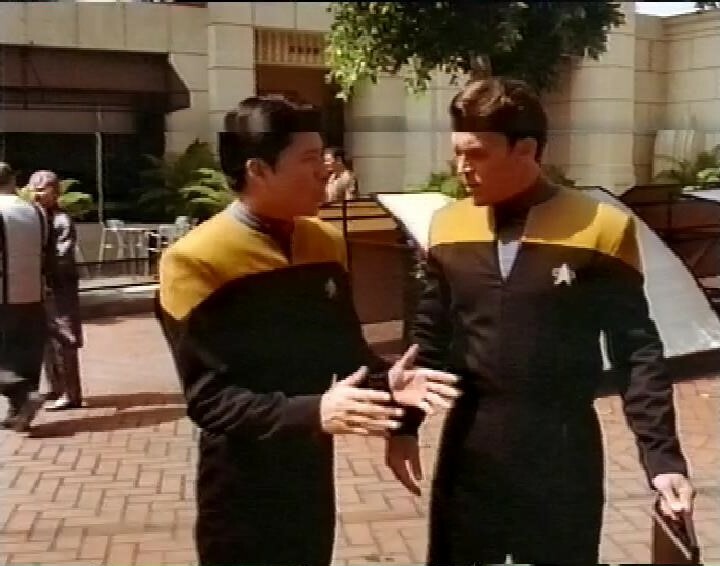 Harry Kim wakes up in San Fransisco, not on Voyager at all. You’ll note this tape has a bit of damage. It gets better as the tape goes on, but it’s there through most of the tape. This ought to be an interesting episode, given that it’s an alternate reality story, but when it’s given to the least interesting character on the ship, it never really takes flight. Also, given that this is genuinely a different timeline, it’s hard to know why Harry wants to leave. He’s back on Earth, engaged to the love of his life, and doing interesting work, so why he wants to go back to Voyager, where he might never get back home, isn’t entirely clear. So this one counts in the smaller set of alternate universe episodes that aren’t the best episodes of the series. After this, recording continues with The Simpsons. 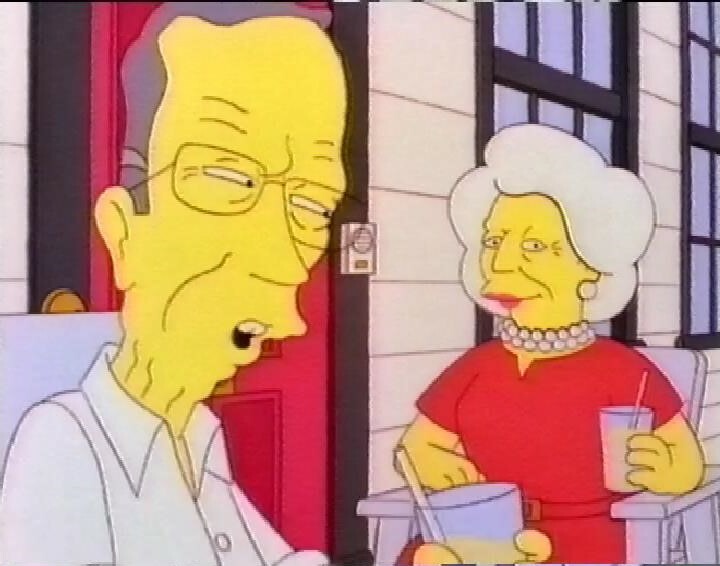 In Two Bad Neighbours, George and Barbara Bush move in across the road from Homer and Marge. Then recording switches to an episode of Seinfeld, The Cigar Store Indian. 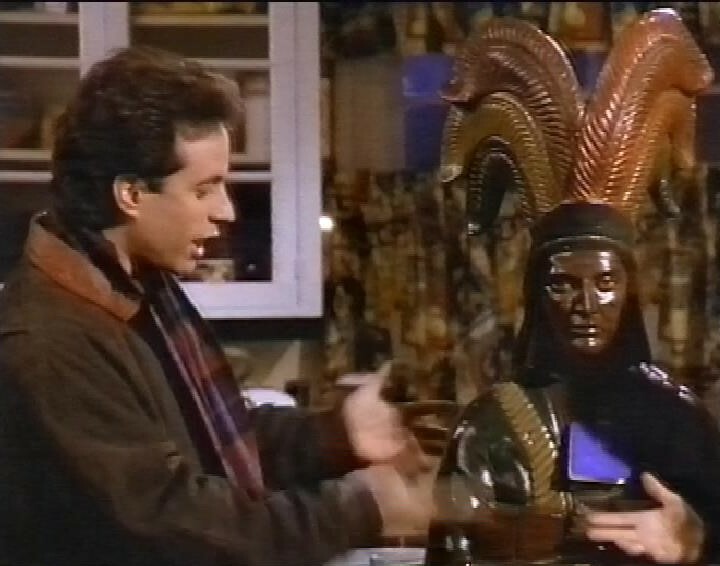 Jerry buys a cigar store Indian figure for Elaine, without realising that Elaine’s friend is Native American. There’s a fair amount of “I’m not racist but” jokes in this that haven’t aged well. It now sounds too much like a sweaty gammon complaining about political correctness gone mad. After this, for no reason I can fathom, the recording switches to BBC1 and a public information film about old people dying of clothing fires. Then Peter Offer wishes us a good night, and BBC1 closes down with the National Anthem. From the mention that the Oscars are live on BBC2, I suspect this was early Tuesday Morning March 26th 1996. I have no idea why I would have that tiny fragment recorded. It doesn’t look like something I recorded over, as there’s not the telltale static roll that VHS overrecording has. Very weird. And a short tape today. I've got around 3000 VHS tapes sitting in boxes in my garage. I'm archiving them one by one. This is a blog listing what's on each tape. In unnecessary detail.